To address a growing need for remote access to high volume numerical weather prediction and global climate models and data, the National Climatic Data Center (NCDC), along with the National Centers for Environmental Prediction (NCEP) and the Geophysical Fluid Dynamics Laboratory (GFDL), initiated the NOAA Operational Model Archive and Distribution System (NOMADS) project. NOMADS addresses model data access needs as outlined in the U.S. Weather Research Program (USWRP) Implementation Plan for Research in Quantitative Precipitation Forecasting and Data Assimilation to "redeem practical value of research findings and facilitate their transfer into operations." The NOMADS framework was also developed to facilitate climate model and observational data inter-comparison issues as discussed in documents such as the Intergovernmental Panel on Climate Change (IPCC 1990, 1995, 2001) and the U.S. National Assessment (2000). NOMADS is being developed as “A Unified Climate and Weather Archive@ so that users can make decisions about their specific needs on time scales from days (weather), to months (El Nino), to decades (global warming). promote product development and collaborations within the geo-science communities (ocean, weather, and climate) and foster inter-disciplinary research to study multiple earth systems using collections of distributed data under a sustainable system architecture. 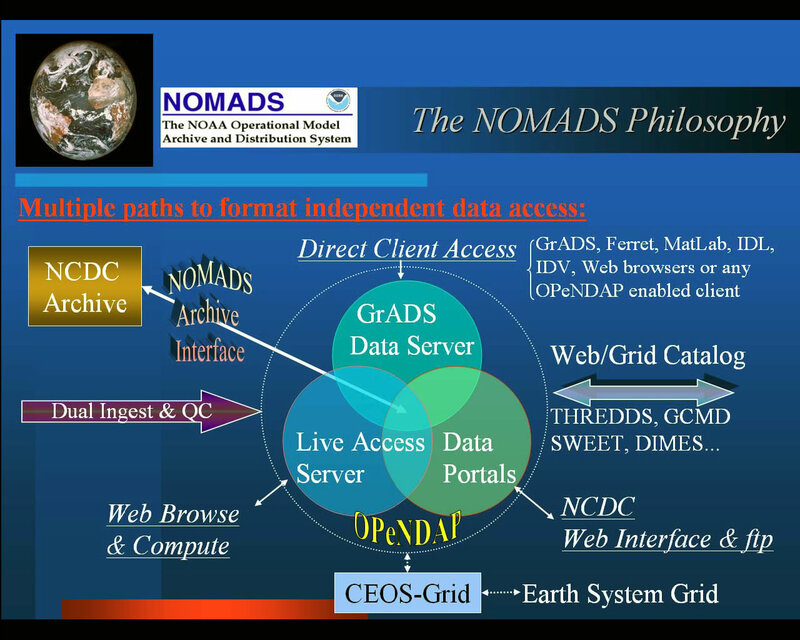 Today NOMADS servers at NCEP and NCDC provide roughly 1 million individual downloads per month serving over 5TB of model data. All sectors of the community are using NOMADS including foreign governments that use NOMADS services for their operational forecasting capabilities. Further, NOMADS is the primary NOAA distribution point for the new NCEP North American Regional Reanalysis (NARR) and soon the Coupled Climate Model from NCEP. Observational data is also available under the NOMADS construct providing format neutral access and inter-operability across these data types. Both researchers and policy-makers alike now expect NOAA’s national data assets to be easily accessible and interoperable with each other, regardless of their physical location. Under NOMADS and its collaborators, NOMADS has already extended its capabilities into a pilot Radar and Satellite NOMADS server.